My mystery material is no longer so mysterious! Karen guessed correctly that I used raw silk cocoon for the wrapped link in my Joujou Charm Keeper necklace. I'll get a little piece of it in the mail to you asap, Karen and thank you all for playing along with me. I'm really excited to be going back home to Hillsboro, Oregon to teach my Joujou Charm Keeper Necklace in a few weeks...October 18 & 19 to be exact. I've been working on another sample for this class and finished it up before Ike hit. I have to thank Denise Mares for organizing this 2 day workshop. It's going to be so much fun! We'll be making all kinds of fun charms and I'll be teaching lots of wire jewelry making techniques. ...how to make rosary style links and tons of other great stuff. Oh! Remember that mystery material that I had you guessing about here? Well, looky, looky...here it is again! If any of you can guess what it is, I'll send the first correct guesser a little piece of it. If none of you guess correctly, then I'll randomly choose one of you from the comments and send you a little piece. Leave me a guess! Oh, I found some great beads made by Kelly Kuhlman. Take a look at her "seaweed" beads here (scroll down). They aren't made of my mystery material but they really do look like seaweed! There are still a few spots open for this class. Please email Denise for workshop registration: dragonfly@fibersphere.net Hope to see you in class! Just a quick note on the results on my "help for Haiti" auction... Thank you again to Sally Jean for your generous, winning bid on my "Prayers for Jude" piece. I have to say, I'm delighted and amazed at the giving spirit of my fellow artists. There are several more of you who are interested in contributing to the charitable organization Hope for Hatiti. I am happy to combine payments from any of you with the payment I will be sending to Hope for Haiti. If you're interested, please send a paypal payment to my email address: mocknet@sbcglobal.net I'll wait a few days to send our combined donations. There is NO pressure here. Just a desire to help and to give those of you who want to help an opportunity. You all have touched my heart with your generosity. We are all blessed to be able touch the lives of those in need! Rebecca Sower is holding a similar auction on her blog and, in fact, is the one who inspired my auction. Make sure you visit Rebecca's blog as her auction in on for another few days. I'm thrilled with the results of my little auction. The lovely Sally Jean is the high bidder for my piece "Prayers of Jude." Thank you so much, for your generosity, Sally Jean! Your payment, and my matching payment, will be sent directly to Hope for Haiti. This is life in everyday Haiti. As you can see, our help will be a blessing. Thank you again! I've been perusing the news lines this morning and find it interesting, the things that qualify as news. There are so many serious concerns in this world, and yet... Does anyone but me find this disturbing?? Did you know that Haiti is the poorest nation in the Western Hemisphere? Although, here in the Gulf Coast, we've been hit hard by Ike, we in America have access to resources that Haitians can only dream about. Haitians are in desperate need of the basics of life such as food and clean water. Proceeds from this necklace will go to Hope For Haiti. Hope For Haiti is a non-profit, charitable organization. 95.2% of each dollar goes to charitable programs. I will start the bidding at $50.00. Please leave a comment on this post with your bid. I'll take bids until Saturday, Sept. 27, at noon, central time. I'll personally match the highest bid. Please take a look at this video and I think you'll see why I'm so excited to be able to offer a small bit of help. ...had the Texas flag painted on the grill. I felt like a little kid gawking and taking pictures but, dang...that red Hummer made me want to be a fireman for a minute! This is project 10 from Mary Hettmansperger's book "Wrap, Stitch, Fold & Rivet." So, if you're just joining me, I've laid down a challenge for myself...and asked you all to join me if you like...to work through all the projects in Mary's book. This started out to be a summer challenge but I've been a little distracted what with class preparations, hurricanes, and so on...so I'm just going to keep working until I'm through all the projects. Besides, the projects that are the most fun are coming up next! If you'd like to see the details of the challenge, click here. 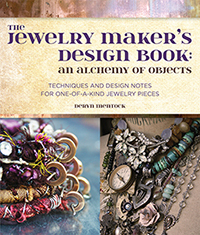 If you'd like to see my project results and those of the other participants, click here, or click on the jewelry challenge blog link in the right sidebar of this blog. Don't forget, if you participate in the challenge, I'll put your name in the hat, for as many projects as you make, to win one of my challenge pieces. This was a fun bracelet to make. I riveted vintage watch faces and pieces of metal cut from an old tin. I've never done chain mail before so that was interesting. I think next time I would make my holes bigger and use a larger gauge sterling for a better "sturdy factor". Still, it's very comfortable to wear and nice to look at. Leave me a comment here linking to your photos of project 10! I want to thank every one of you for your prayers and well wishes. Last Friday, in the dark of night, an unwelcome visitor blew in to wreak havoc and I can't even tell you how much it meant to me to know my friends were thinking of me. We were without water at first and without power until late yesterday. Needless to say, I'm way behind on answering emails and comments and ask your pardon if I don't answer you all individually. We spent the last three days cleaning up at our house and helping our friends and neighbors as much as possible. This is the memorial that stands on the Galveston seawall commemorating the monster hurricane of 1900 in which some 8000 lives were lost. At that time, the city of Galveston was virtually wiped off the coast. This tree stood on a tiny rise in our front yard, which is probably what caused it to fall. The roots just couldn't hold against the wind. Every kid on our block spent countless hours running circles around this tree and rolling down the "hill" it stood on. We figured it to be about 100 years old from the ring count. It was a shock to see it gone but, look how close it came to our neighbor's house! What a blessing that there was no damage whatsoever. Of course, at my house, a tree that's down (and sometimes trees that aren't down!) is a great excuse to bring out the chainsaw. This was my backyard, my favorite oak...again, no damage! Ike was an enormous storm. Many, many people were affected, not just in Texas but in Louisiana and all the way up into Indiana. Ironically, the night after Hurricane Ike, we had a huge thunderstorm with lots more rain. Homes that didn't flood during the hurricane, flooded with this second storm. Houston is the forth largest city in the U.S. and, even though almost 100% of us were without power, we had to boil our water for awhile, school is out until Monday and water, ice and gas are in short supply...we're blessed. A cool front worked it's way down to us so we didn't suffer the heat for too long. For my family personally, it could have been so much worse; and for many, it was. Please extend your prayers to the people in our part of the country and those in Haiti, Cuba and elsewhere that were affected. This is heartbreaking. You can see that many homes were completely washed out to sea. They think as many as 500 people tried to weather the storm on Bolivar Peninsula. Bolivar Peninsula and Galveston Island are without water, sewer, electricity, food, water...you get the idea. Yes, we're "hunkerin' down" as we say here in Texas...waiting for the monster. We're not under manditory evacuation where my house is and, in fact, have been told to "shelter in place" (again!). Ike is coming our way. It came in the mail yesterday; just in time to be my special "hurricane amulet." It's ironic to me, or maybe not so much, that Cindy fashioned this gorgeous necklace of beautiful elements from the sea...and an incredible, vintage cross. What with the storm and sea bearing down on us as I write this, I may just wear it all night as a reminder of our Protector. "Fight! Fight! Stand up and fight for America!"